With our most recent guild event, I noticed that some of our less Lockdown-active players were having trouble queueing thanks to SK's unintuitive interface. Here I will explain how to get into T1 Lockdown, which will probably be our most common tier. 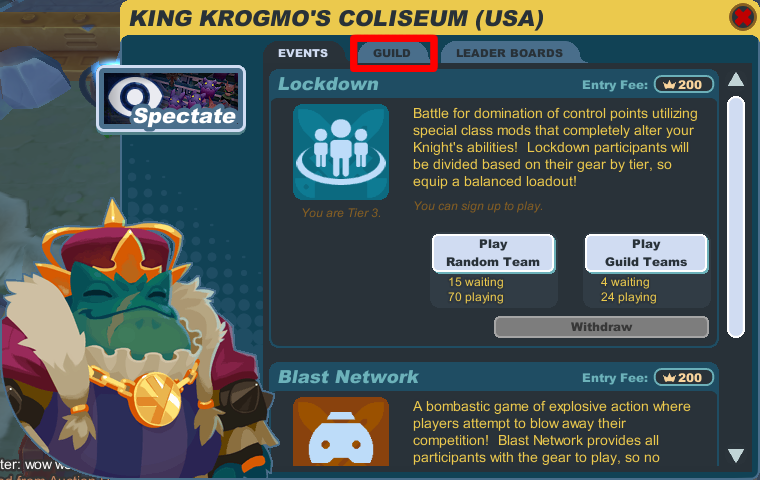 Costumes do not matter; however, they will not be displayed in the Lockdown arena. Additionally, if you are instructed to use Proto Bomb, you can buy it for 150 crowns from Ricasso in the Bazaar. After your equipment is set, you must unmark all your non-T1 loadouts. Having a T2/T3 loadout active will put you in T2/T3 Lockdown. Open your Loadouts window(unless you do not use loadouts, then skip this step). The swords icon beside each loadout indicate its type. As seen in the image above, green, uncrossed swords are PvE sets that are unmarked. Red, crossed swords are PvP sets. Click on the swords to change the type of the loadout. Note, however, that you cannot unmark <Current Equipment>, and as such, you must also make sure that your current equipment is 0* or 1*(except for costumes). Unmark all sets that have any equipment that is not below 2*(except for costumes). Optionally, equip what you're going to take into Lockdown and just unmark everything. Finally, to queue, click the Coliseum button, click the Guild tab and join the group(or create it if it doesn't exist). Note that Lockdown also costs 200 crowns per game(should your team win, you will receive 280 crowns). If you cannot afford it, an officer or guildmaster will be happy to cover your fee for a guild event. If we choose to play T2 Lockdown instead, the same rules apply, except that equipment must be 3* or below. T3 Lockdown has no restrictions. 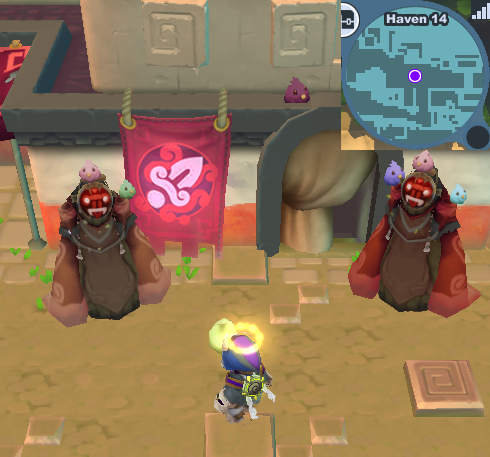 Guardian. Shielding gives you a normal shield. After one second of shielding, it becomes a large shield that will protect and heal you and your teammates. It can and will break, like normal shields, if it takes too much damage – including damage that protected teammates take. Additionally, guardians have a large bonus to health. Recon. Shielding gives you a cloak that makes you invisible to the other team. Additionally, you emit a pulse every two seconds that will mark opponents in range. They are first given a yellow warning mark, which does nothing but alert them of your presence. If they have a yellow mark when hit by the pulse again, they receive a death mark, which removes ALL defense of that player for a few seconds. If you are hit while using the cloak, the cloak will break instantly. It takes some time to recharge. Additionally, recons have a moderate bonus to health. Striker. Shielding causes you to move very quickly. You move faster if you are facing the direction that you are boosting. If you are hit while using the boost, it will lose some charge, but not always all. It takes a few seconds to regenerate. Additionally, strikers have a mild penalty to health. You can change classes by returning to your base, or after you are defeated. You can also change between MARKED loadouts here. All three shields can be used to shield-cancel and shield-charge unless they are broken. Lockdown is a control point game. Your team earns score every five seconds depending on the number of control points you currently hold. To capture a point, stand on it until the point changes to your team's color. This will take longer if the point is currently possessed by the opposing team, and will take shorter if more players are on the point. Your team wins when you reach 500 score if the map has three control points, or 900 score if the map has five. I must say I am enjoying Recon and using a Gun, so fun to come out of the shadows with a hail of bullets!